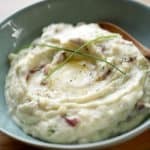 These Sour Cream Mashed Potatoes with fresh chives are a wonderful side dish to any Sunday night dinner! Quick and easy and so delicious! Boil potatoes, with skins on, until tender. Transfer to the bowl of an electric mixer. Add 4 tbsp (60 ml) of butter and beat until potatoes are mashed and butter is melted. Add sour cream and milk and beat just until combined. Add salt, pepper and chives. Beat to combine. Transfer to a serving bowl and with a spatula create a divot. In the divot place remaining 1 tbsp (15 ml) of butter and garnish with freshly cracked pepper and 2 long chives in a slender “X” pattern. Do not drop potatoes into boiling water. Instead, place your potatoes in cold water and allow them to heat up with the water. This will assure your potatoes will cook evenly. Potatoes absorb salt really quickly so it’s important to season well with at least 1/2 tsp (2.5ml) of salt to begin. You can substitute the sour cream for all milk. But you won’t get that “tang” associated with sour cream. Add more milk for thinner potatoes and add less milk for thicker mashed potatoes.